Summer 2018 is here: It arrived with gusto, and kind of earlier than usual, but it seems like, more and more, summer arrives earlier and stays later. It could be that our world is changing, at least for now. One thing that hasn’t changed yet is that fish like to eat in the summer, and that means if we keep a couple of things in mind, we can catch more fish. Following are some of those things. When it comes to fishing, regardless of season, the key thing to keep in mind for fishing success it that you’ve got to find the fish. We’ve said it before and will probably say it again: You can have all the best rods, reels, boats and lures, but if the fish don’t see your lure, they can’t bite it. We’ve got to figure out what lure is best for the situation, then we’ve got to put it where it will do some good. Sam Amsbaugh took this large, bulky bass on a weedline a couple of summers ago. In the spring, most freshwater fish will be in the shallows where they spawn. Now that the spawn has been completed, they will be where the food is. That could be pretty much anywhere in the water system you are fishing. Weedlines are often a good starting point. Several species of fish will hang out along the weedline. 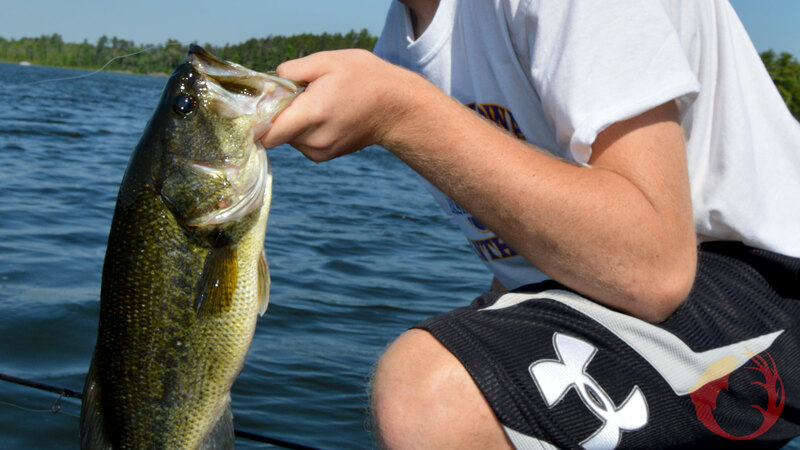 You’ll find largemouth bass, walleyes, panfish, and northern pike on the weedline. If two anglers are fishing, it works great to have one angler throw a crankbait and the other a jigworm. This way you’re showing the fish two very different presentations. If the fish are hitting one bait better than the other, both anglers should throw that style of bait, but they should also continue to experiment. Here’s a good way to start. The angler in the bow of the boat should tie on a Strike King Pro Model Series 4 crankbait. This is an outstanding crankbait that will allow an angler to cover water quickly. Cast it along the weedline. It will catch any fish that works the weedline. The angler in the back of the boat should thread something like a Strike King Finesse Worm onto a Slurp! Jig. I would probably start with an eighth ounce head and a five inch worm. This set-up will catch the fish that weren’t aggressive enough to hit the faster moving crankbait. Now, let’s say the crankbait is really producing fish. The angler in the back of the boat wants to get in on the action, understandably so. Instead of tying on the exact same crankbait, try a different shape, maybe a Lucky Shad, or try a different color. What we want to do is key in on the exact bait that the fish are most likely to eat on that day. However, maybe the plastic is producing better than the crankbait. Try a larger worm, or go to a plastic with a bulkier body. Larger and bulkier bodies will often tempt larger and bulkier fish. In the summer, along the weedline or on deeper structures, sometimes the fish will be scattered, sometimes they’ll be tightly schooled. You might catch one here and one there, or you might discover that you have to be very precise as to where you put your bait. On the weedline, look for points or pockets in the weeds to hold concentrations of fish. On deeper structures, maybe a rockpile or a corner on a large flat will hold schools of walleyes, bass, or crappies. In the summer, the fish have to eat. If you put your bait where they are, oftentimes they’ll eat it. For most of us, getting bit is why we go fishing. If you keep these ideas in mind this summer, you’ll get bit a lot.